▪ Performer and Artist/endorser at the National Association of Music Merchants Show 2017 in Anaheim, California with Eastman Saxophones. NAMM is one of the largest music trade shows in the world. 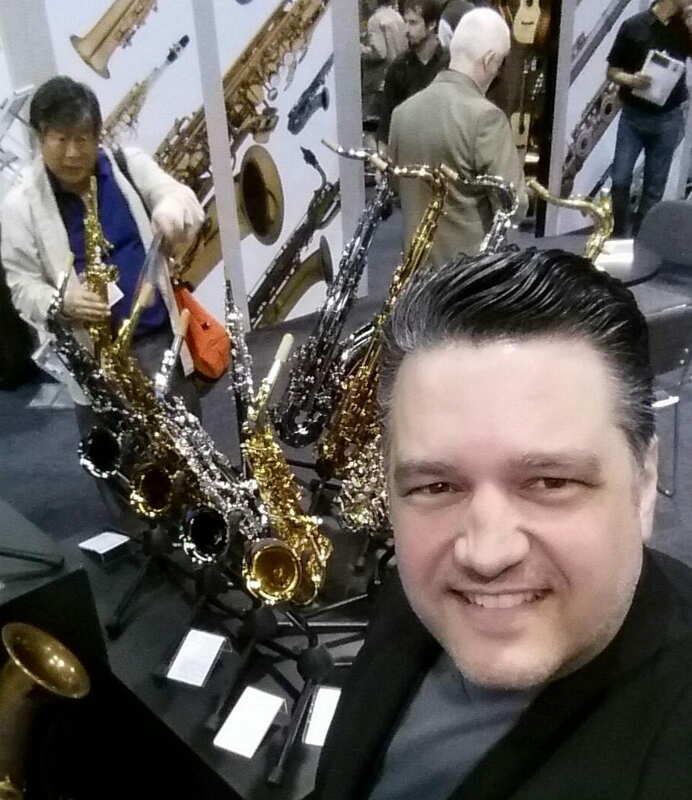 This entry was posted in alumni students faculty NEWS and tagged Enkor, NAMM, saxophone on January 25, 2017 by Thomas S. Clark. Texas State’s small trumpet ensemble was just named semi-finalists in the prestigious National Trumpet Competition to be held in Denver in March. Other schools in the semi-finals include the University of Michigan, Boston University, McGill University, Cincinnati Conservatory, Indiana University, New England Conservatory and the University of Miami. The group, Connor Towns, Esteban Borjas, Scott Crum, Aaron Rachui, Michael Lehman, and Jason Martinez, will perform an arrangement by Connor of Jennifer Higdon’s Sky Quartet. Connor, who studies composition with Dr. Michael Ippolito, recently found out that Ms. Higdon is going to publish his arrangement. This entry was posted in alumni students faculty NEWS on January 24, 2017 by Thomas S. Clark. The Provost has reminded us all of Our Shared Values as a university community, which include valuing . . . This entry was posted in Director's DIARY on January 16, 2017 by Thomas S. Clark. Teaching is not so much imparting knowledge as it is facilitating learning. A teacher is an enabling coach on the sideline; all the on-field action is by the student, the learner. From a veteran coach, here is a simple but effective playbook. Each rule is a command to action. Rule 1: SHOW UP. Rule 2: PAY ATTENTION. Rule 3: DO THE WORK. Rule 4: JOIN A TEAM. Rule 5: PLAN AHEAD. Rule 6: BECOME A LEADER. Feel free to quote and pass them on! Texas State School of Music jazz faculty Bennett Wood, Utah Hamrick, Russell Scanlon, former faculty John Mills, and Hank Hehmsoth convened in New Orleans at the JEN Jazz Education Network convention. Hehmsoth and Scanlon were featured performers with Times Ten, directed by John Mills, on January 7. This entry was posted in alumni students faculty NEWS and tagged jazz education, Times Ten on January 9, 2017 by Thomas S. Clark. The Texas State Symphony Orchestra under the direction of Dr. Carolyn Watson was given an Honorable Mention in the 2016 Ernst Bacon Award for the Performance of American Music (College/University) Division for their role in the premiere of the opera, Lady Bird. This entry was posted in alumni students faculty NEWS and tagged Ernst Bacon, Lady Bird, opera premiere, orchestra on January 6, 2017 by Thomas S. Clark.